Linden looks like many untended alleys with a mix of light industrial, office and residential uses. The limited width of the six foot wide sidewalks leave little space for pedestrians or landscaping. 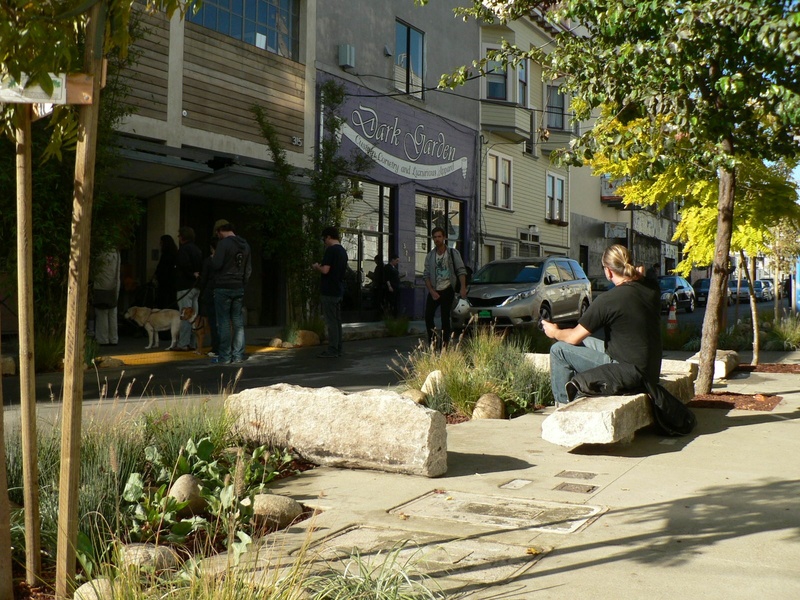 By removing three car parking spaces and narrowing the road way, the street is re-organized to accommodate wider landscaped sidewalks with seating areas. The road is tabled to the same level as the sidewalk to blur the distinction between the pedestrian and automobile realms and to create a unified space. Planters, benches, and recycled granite curbstones are arranged to function as barriers yet create the illusion of a continuous “outdoor living room”. When completed, Linden living alley will serve as a comfortable “great good place” for the habitual customers of Blue Bottle cafe. Ames alley is a 15′ wide alley in the Mission District that serves as the primary access to a handful of alley dwellings and rear garages. The addition of three new dwellings provided the opportunity to re-address the use and feel of the alley. The minimal width and casual utilitarian function primarily oriented for car parking lead to an examination of opportunities for narrow planting along the edges that would define the alley with more landscape. In addition to greening the alley with planting, the design calls for sustainability through storm water infiltration with the use of recycled and permeable paving materials ad lunar resonant exterior lighting. This lead to treating the paving as the canvas. 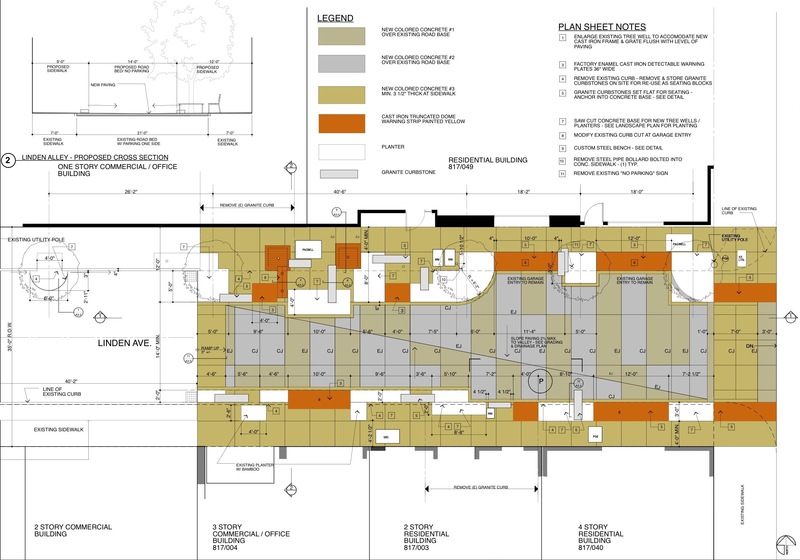 By looking for ways to cut in a collage of paving materials to create paths and places with specific uses particular to the existing zones of the alley. This looks like a really good idea-particularly in pedestrian friendly areas like Hayes Valley. The alleys really need to get cleaned up and this should help.